I have to admit: ever since I watched April Bloomfield on Mind of a Chef take her inspiration, I have been ever so obsessed with the concept of the morning bun. I wonder if it is because of all that European viennoiserie that these are not really something we have in the UK but when you see the experts at Tartine Bakery in San Francisco demonstrate their glorious beauties on the show, then I defy you not to think this is a great idea. Like endearing April, I can’t help but fiddle with the concept thinking up fillings. It sort of reminds me of a traditional Jewish Rugelach but with better pastry. I used to watch my grandmother make those many years back and that combo of jam, nuts and fruit got me thinking too. As I had friends over today for Sunday brunch I decided that I would give them a go. I tried a couple of different fillings using simple shop bought croissant dough and playing around with sizes. My easy silicon mould was a great size but I am sure a tin base would get a more effective crunchy base. Admittedly the pastry itself was just a little bit disappointing, not helped by my lack of wash before baking, but the results were pretty good for a first attempt. For sweet, I went with a use of of the delicious marmalade that my gardener made me for Christmas as the base, topped with raisins and pecans. Part morning bun, part rugelach. For savoury, another use up. The end of last week’s pesto (I told you it had many uses) with extra pine kernels and cheese. I tried two different sizes. The marmalade proved a little too generous after cooking falling to the bottom and stopping that delicious crunchy base, but they were a good size. Either way, if you are looking for an impressive but achingly simple way to impress for breakfast then just buy some croissant dough and go for it. This week I was given a lovely present of an abundance of organic Summer berries. The colours and flavours were so fantastic and in order to preserve the memory, I was given a lesson in jam making by my present bearing friend. I did however save a bowl of the blackcurrants which are truly my favourite Summer fruit, not only for their colour but also that unique, just-picked-from-nature flavour which can be sour, but were just wild and wonderful this time. The jam making started with the food prep and using a fork to get all those tiny currants off their stems – an easy solution to a fiddly problem. The result was a bowlful of berries that oozed temptation. 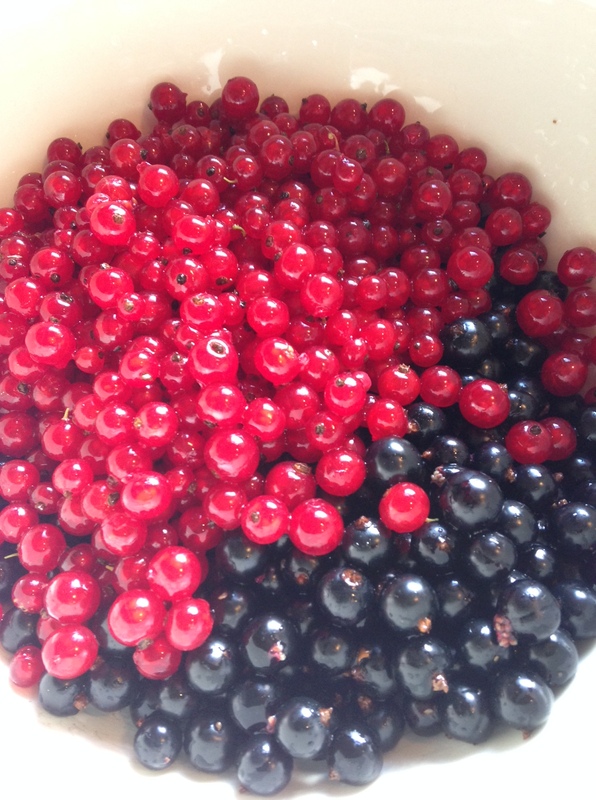 I was under strict instruction to separate the currants from the berries as they cook at different times and if you are not careful some turn to mush and others aren’t ready. And weigh them first as you need that to calculate the ratio of sugar to add. 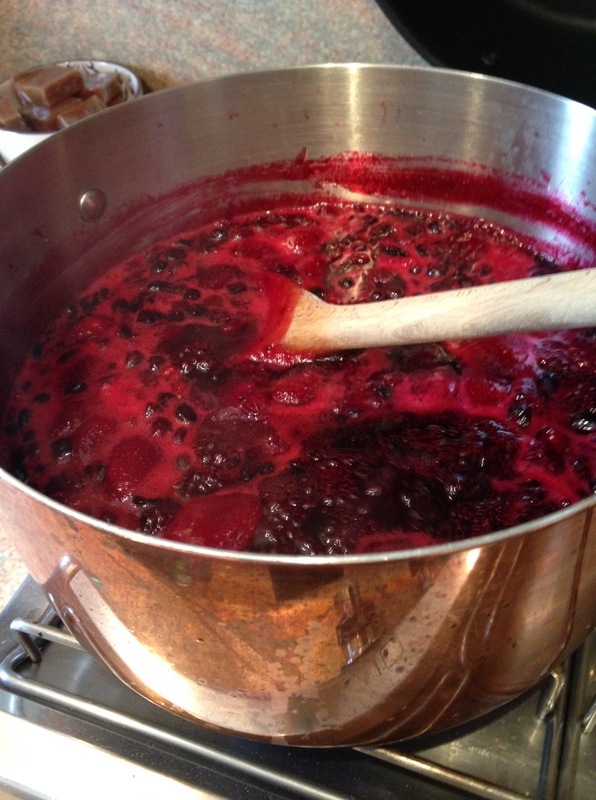 So in went the berries to my lovely copper pan, which seemed the most appropriate vessel for this process. Nothing else, just pure berries and a medium heat and ten minutes or so later we had a glorious pot of colour that was ready for the addition of the berries. It was a quick few minutes to just heat them through before they gave way to their fruit and juice and I was ready to add the sugar. My friend’s recipe is equal parts of fruit to sugar so there was a lot to add. Stir it in and keep cooking til the jam is ready. So how do you know when it is ready? Well it seems to me that anyone who is a jam maker has their own way of figuring that out. One friend keeps a plate in the fridge and then drops the ready liquid onto the plate and returns to the fridge to see if it is set. Today my friend merely put it on a plate and pulled a finger through. When there is a clear discernible line then all is good. Whilst waiting for this, we sterilised the collection of jars I had. This is pretty critical to the process of keeping everything preserved to its best. So a thorough boiling and we were ready. Jarring up is a messy process when you don’t have all the professional kit, but hey, that’s part of the fun. 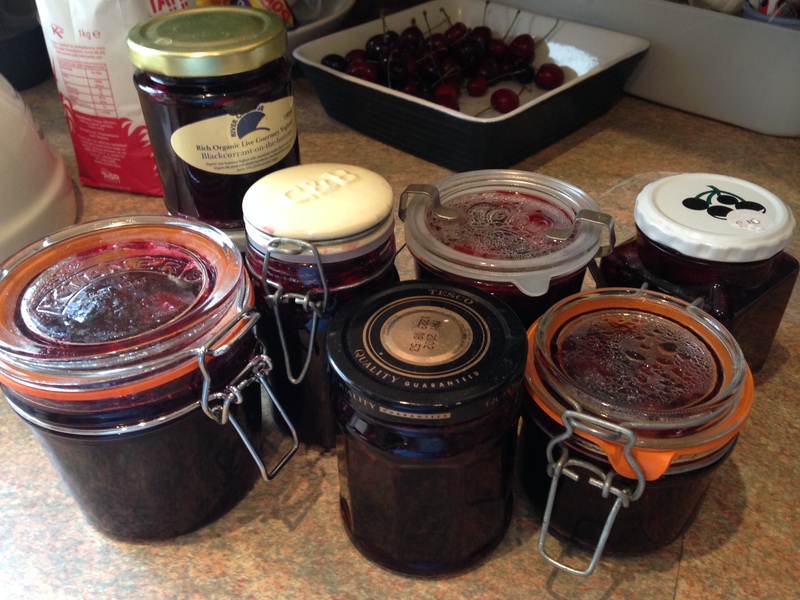 And top tip… when the jam is in the jar, and the lid sealed and on, just tip the jar upside down to let all the air dissipate. We had a bit of a disaster with one jar, but hey ho. It’s all part of the fun. 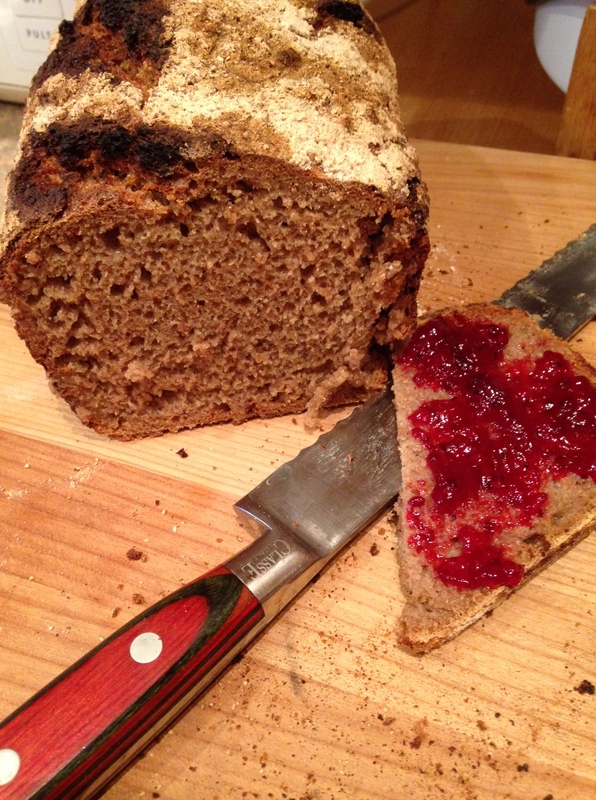 On Sunday I completed my tried and tested rye bread recipe which always produces a great loaf with my happy healthy sourdough starter and I have to say, tucking into a piece of warm bread with a dollop of jam was very satisfying indeed.